RS Components has announced details of its participation at electronica this year, where it will be showcasing the latest technologies. Visitors to the stand will also be able to take part in many special events, which includes a Robot Football Tournament, a Wheel of Fortune game and the Big Step Challenge – with numerous prizes to be won, including a €2,500 holiday voucher. Appearing on the company’s stand will be key innovators who have been an inspiration to engineers around the world. For example, in the ‘For The Inspired’ zone, you can find out more about the innovative projects produced by customers and suppliers. In the DesignSpark zone, there will be demos of the company’s suite of free and easy-to-use professional CAD software tools; plus innovative designs created using DesignSpark tools and support. And in the ‘RS Pro’ zone, there will be a real-life workbench that highlights a range of RS Pro electronics, electrical and mechanical products, including tool chests, hand tools, test and measurement equipment, and their latest 3D printer. 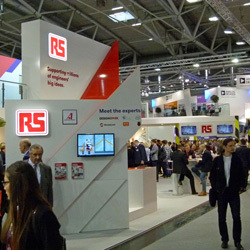 As well as the RS stand, the company has a presence in Hall C6 – the electronica experience hall. This area will focus on a range of STEM-based educational demos and activities.